Edito’s Note: Since none of us were able to attend the Rage Art, Tekken 7 launch, here’s a highlight post of what was sent to us from the event. Images are from the PlayBook Video Game Lounge and Book Shop fanpage. 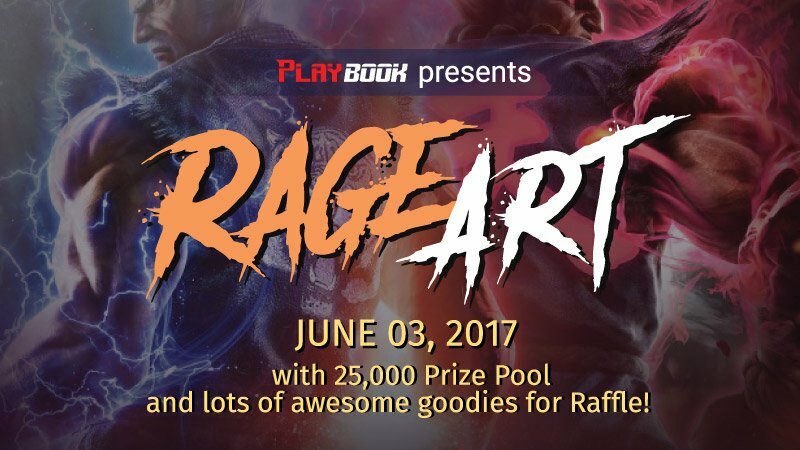 Rage Art at PlayBook Makati, a Tekken 7 launch tournament, concluded last Saturday, June 3, 2017. It was a tournament filled with so much excitement, with the days leading to the event just as hyped as the tournament day itself. When SplitMediaLabs, in partnership with PlayBook Esports, announced the Philippine launch tournament for Tekken 7 with a 25,000 PHP prize pool, the Philippine Tekken community was abuzz with excitement and enthusiasm. It was to be one of the biggest Tekken tournaments in recent history, with registration reaching 100 players a mere three days after the announcement. Due to the overwhelming positive reception, the tournament organizers had to cap the tournament at 128 players, which was filled in just one week. The excitement didn’t end there however, as Twitch got onboard and would double the prize pool, making it a total of 50,000 PHP, the biggest prize pool for any Tekken tournament the country had ever seen. Then, REV Major Philippines was announced, a master event of the Tekken World Tour. This caught the attention of two Tekken 7 world champions, Echo Fox’s Saint and JDCR. 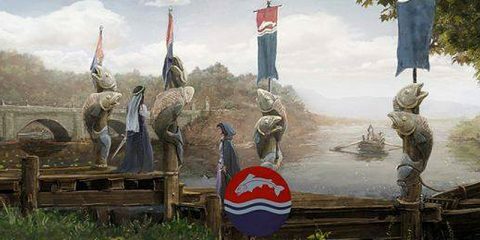 Both of them registered for the event and the tournament cap was increased to accommodate everyone who expressed interest in joining the tournament. The Philippines had its work cut out for them as these two world class players would grace the country with their presence. Come tournament day, and people were already lined up and ready for the event as early as 7:30 in the morning! 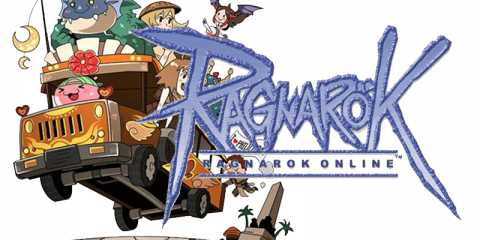 People were eager to get their hands on the latest iteration of the twenty year old fighting game franchise and find the smallest advantage before the tournament actually started. After registration, over 100 players had signed up and were divided into eight pools where only two would qualify and move on to the top 16. The pool stage was divided into 2 sets. Pools A, B, C and D would run first, then E, F, G and H would follow. Pool A had the King of Iron Fist World champion, Echo Fox | Saint, easily qualify in the winner’s side while Philippine player, Prime fought his way back from the loser’s bracket to secure his slot. Muzikat nearly defeat Philippine Tekken prodigy, Alexandre “PBE.AK” Laverez in Pool B’s winners finals. He was up 1-0 and on match point but AK pulled of a heroic come back and clutched it out to qualify in winners. Muzikat would make it out after the pool’s final match. The recently crowned Timezone Philippines Tekken 7 champion, PBE.Doujin, breezed through the winner’s side of Pool C while SquareSquare fought to earn his slot in the top 16. The King of Iron fist Asia Qualifier top 8 finalist, PBE.Maru, dominated Pool D, defeating Saakuragi in the winners final. Saakuragi would redeem himself in the lower bracket and both would move on to top 16. In Pool E, just like his teammate, Echo Fox | JDCR went undefeated. In this case, it was Legion’s Noelittle who fell victim to the world champion in the winners finals, but made it out in the lower bracket. The most stacked pool in terms of local talent was Pool F and was considered the “death pool” of the tournament. Names like Hapon, Sen, Silverheel, Brawt Jr., Coffee_Prinz, IPT.El, Bruisemaker, and Tomahawk, made it an extremely competitive pool. In the end, it was IPT.El and Coffee_Prinz who qualified for the top 16. And the remaining pools – Pools G and H – saw Grounderz, Sephrix, Dobu_Orochi, and Elite.ErrorQueen qualify for the top 16. But the games weren’t the only highlight of the event, though. Through the generosity of the event’s sponsors, spectators and players alike won various prizes and goodies and it became a highlight for the crowd as each time event host, Billy Añonuevo, picked up the mic, the crowd would chant, “RAFFLE RAFFLE RAFFLE”, and the prizes were amazing! 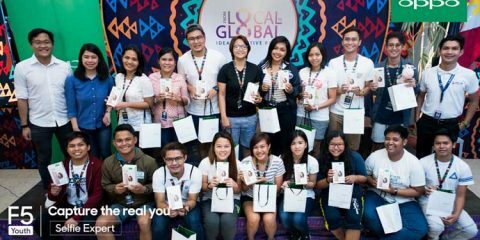 NVIDIA generously gave away their awesome shirts, Globe provided NBA League Passes (just in time for the NBA Finals) and an autographed, Glenn Rice Shirt, FatBoys Pizza not only provided 500php gift certificates but also 50 boxes of their delicious pizza! Datablitz provided Dobe Dualshock 4 charging docks and multiple copies of Tekken 7! 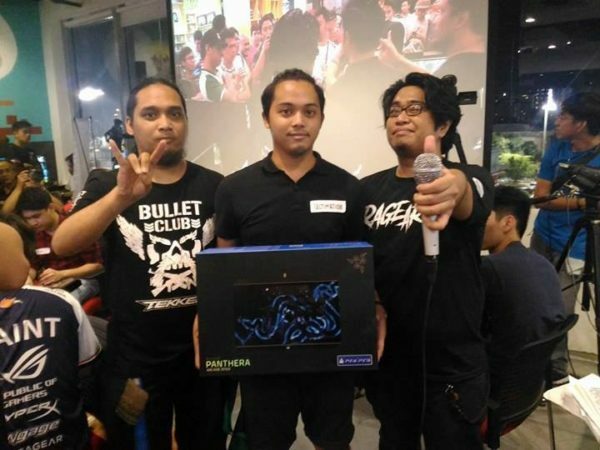 Razer would not be outdone, though, as they not only provided the two Razer Panthera sticks for the stage, but they also raffled off gaming headsets, video capture cards, L33T packs and gave away a fight stick to the crowd! At the end of the day, the spotlight still belonged to the players. Top 16 saw Echo Fox | Saint and JDCR go at it in the winners second round. It was a sight everyone wanted to see, but didn’t expect so early on in the top 16 bracket. JDCR would repeat his performance from Combobreaker and handily defeat his teammate and move on into the winners top 8. Saint would beast his way through to top 8 in loser’s side not losing a single game to any Filipino players. PBE.AK did well on his side of the bracket, qualifying in top 8 winners without a loss, while Coffee_Prinz and Prime earned their spots in winner’s side top 8. In the lower bracket, Noelittle and IPT.El fought hard and qualified in loser’s bracket top 8. We then saw a team kill as PBE.Maru and PBE.Doujin fought for the final spot in top 8. It was a back and forth affair as the 2 team mates gave it everything they had. In the end, PBE.Doujin came out the winner. Thus, the stage was set for a very hyped and dramatic top 8. Before top 8 began, everyone stopped to watch a special message from none other than the producer and director of Bandai Namco Entertainment, Katsuhiro Harada and senior game designer of the Project TEKKEN team at Bandai Namco, Michael Murray. The video meant a lot to a country that has Tekken as its “national fighting game” and it definitely inspired everyone in attendance. By this time, the Matcherino donations had accumulated to over 600 USD, bumping the official prize pool to a whopping 80,000 PHP! Top 8 opened up with Echo Fox | JDCR vs Coffee_Prinz. In spite of being one of the top players in the Philippines, Jeffrey “Coffee_Prinz” Gonzales still had a mountain of a challenge in front of him. He went in head on with his signature Steve Fox but JDCR’s Dragunov also went all out and opened the first game with a perfect and took three straight rounds with barely a scratch. In the second game Coffee_Prinz showed signs of life as he started to get a read on JDCR’s habits, but being the Tekken world champion that he is, Echo Fox | JDCR quickly weathered the storm and took the second game and then the series in three games. The other side of winners saw tournament favorite, PBE.AK go up against Prime. AK went with Jack-7 and Prime would pick Bryan. Prime seemed to have a good read on AK and had a lot of mileage using Bryan’s Orbital kick, but, despite that, the Philippine prodigy would clutch the first game and go on to dominate in the second game ending with a resounding perfect to the delight of the crowd. This prompted Prime to make a character switch to Dragunov. The switch worked for Prime as he was able to take the third game and bring the series closer, 2-1. Eager to secure his ticket to winner’s finals, AK retaliated with a character change of his own and went straight to Paul and closed out the series, 3-1. The first match in loser’s bracket had Imperium Pro Team’s El and his Devil Jin go up against PlayBook Esports’ Doujin and his plethora of characters. This was a classic battle between two of the top FG teams in the country. IPT El opened up the series with a very impressive game one victory over Doujin’s Dragunov. Being the crafty player that he is, Doujin immediately switched to Jack-7 and took three straight games to close the series. The second lower bracket match saw local PH top player Noelittle take on Echo Fox | Saint. Noelittle went in with this main character, Hwoarang and Saint picked Shaheen out of nowhere and swept the series 3-0. Continuing the top 8 were the 2 matches to qualify for top 4. In the first match, PBE.Doujin whipped out a surprise Kazumi pick vs Coffee_Prinz’ Steve. The pick proved to be quite effective as Doujin displayed an amazing mastery of the character to easily take the set 3-0. In the second match, we saw Echo Fox | Saint go up against Prime in what turned out to be one of the most hyped matches of the evening. The Koreans had not lost a single game to any of the Filipino players and Prime stepped up to the challenge. Saint opened up with a very dominating first game with his Eddy taking three straight rounds over Prime’s Bryan. Prime then immediately went to character select and brought out his Dragunov and pushed the second game to the final round. After a series of successful down 2 attacks, Saint clutched the game with a grab following a counter hit down 2 from Dragunov to extend his lead, 2-0. In an all or nothing third game, Prime was able to pull out a two round lead over Saint. However, with a series of amazing spacing and whiff punishing, Saint easily caught up in rounds, but dropped a potential Rage Art confirm. Prime happily took advantage handing the Korean his first loss of the tournament as the crowd went wild. Not wanting to waste any more time, Saint went for his bread and butter world champion, Jack-7. Despite the character change, the momentum and the crowd were clearly on Prime’s side. He jumped out to a two rounds to one lead and a chance to take the game. An unwarranted slide to try and end the game cost him the match though as Saint properly whiff punished and took the fourth round and never looked back, ending the series 3-1. Four competitors, two teams, one championship. Team Echo Fox’s JDCR and Saint taking on PlayBook Esports Team’s AK and Doujin. The winner’s bracket finals had Echo Fox | JDCR go up against Philippine Tekken Prodigy, PBE.AK. JDCR came out with a very commanding 3-1 victory in rounds to take the first game and clearly AK needed to make something happen. Switching immediately to his previous main, Law, AK looked to turn the tide of the match but to no avail as JDCR dominated the remaining games, playing perfectly, and sending AK to loser’s bracket. In the loser’s semi-finals was the other Echo Fox vs PBE match up, Saint vs. Doujin. Both players opening with Jack-7 in a wild mirror match. Both players were blocking each other’s rage drive round after round. In a very close final round, Saint was able to eke out a win after a pair of correct punishes and a whiff punish when he was on his last limbs. Doujin went to character select right away and brought out his Kazumi. The pick seemed to be effective as Doujin got a lot of mileage from Kazumi’s down back 4 and dominated game two, taking 3 three rounds, and prompting Saint to switch to Dragunov. In the third game Doujin continued to dominate making great use of Kazumi’s hop knee numerous times and catching Saint by surprise. He made short work of the Dragunov pick. Doujin was now up 2-1 and for the first time in the tournament, Saint had been handed two losses! Visibly shaken and unsure of himself, Saint went for a character switch to Eddy hoping to tie the series at 2 games each. But Doujin did not relinquish his advantage as he closed the series with an impressive 3-1 victory over Echo Fox | Saint. The crowd erupted in cheers as the 17 year old Philippine player took down the King of Iron Fist world champion! This set the stage for an all Filipino loser’s finals match as we were guaranteed a Philippines vs. South Korea grand finals. By this time, the stream had already reached a total of 6,300 viewers as we were slowly approaching the climax of the tournament. Doujin had already fought AK multiple times in previous tournaments. Both players would trade wins in two previous encounters. 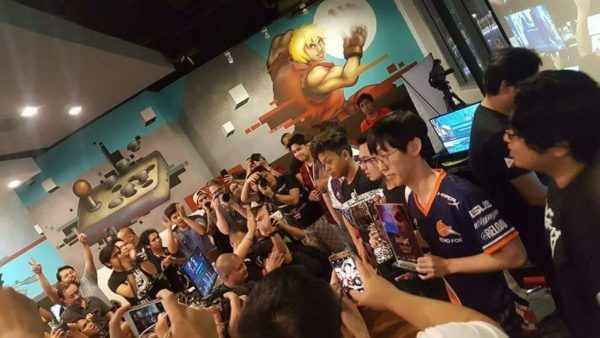 In their most recent outing Doujin bested AK in the Timezone Philippine championships and prior to that AK had defeated Doujin in the King of Iron Fist Asia qualifier. This loser’s finals match at Rage Art would be the rubber match. Doujin would pick Hwoarang, the same character he defeated AK with in the Timezone tournament. Confidence from beating world champion Saint, Doujin opened the first game with a quick 3 rounds 1 win thanks to a couple of amazing set ups. AK went to rematch right away wanting to get the game back, but Doujin started game two with a PERFECT round. AK responded with a second and third round win after adjusting to Doujin’s game and continued to dominate the fourth round tying the series 1-1. The crowd fell silent as they did not know who to cheer, all the while, AK clutched out the third game, adjusting nicely by challenging the flamingo mix ups of Doujin. AK had a chance to advance to the grand finals, getting to match point but dropped a crucial Rage Art combo and allowed Doujin to tie the series yet again 2-2. In the final game, both competitors opened by trading the first 2 rounds showing how equally matched they were. But Doujin would close out the next two rounds booking himself a ticket to the grand finals against Echo Fox | JDCR. Interlude – A Sudden Jump in the Prize Money! Matcherino had already accumulated $700 in donated prize money and out of nowhere, Team Spooky’s own Spooky, Victor Fontanez, announced that he would add $300 more to the pot giving the tournament a total of 100,000 PHP! The stage was set, Echo Fox | JDCR would be going up against PBE.Doujin. Doujin would start game one with his miracle Kazumi which seemed to be effective against the South Koreans. Despite the pick, JDCR was able to win the very close first game prompting Doujin to switch to Jack-7 for the second game. JDCR would quickly vanquish the Filipino Jack-7 as his experience with his teammate proved useful in this fight, side stepping every low that Doujin threw out and appropriately launch punishing. Left with the choice of either Hwoarang or Kazumi, Doujin shocked the crowd as he picked Lars to close out the series. With 8000 viewers watching, all eyes were on the young PBE.Doujin and his Lars. Act two of the grand finals had an interesting plot twists and Doujin would pull off another miracle by leaving it all out on the table, showing no signs of fear or slowing down, he took the must win game 3 and forced a final round in the fourth game. But despite Doujin’s home crowd advantage, JDCR maintained his world championship form and closed out the series, 3-1, taking home the Rage Art championship and the lion’s share of the now 100,000 PHP prize pool. The hype never died down as the crowd would sing the graduation ceremony each time a finalist was awarded. The crowd definitely made the event as great as it was. The organizers would like to thank the Tekken community for coming out in full force. Over two hundred people registered for the event either as a competitor or spectator. The hype the crowd brought to the entire tournament was also a spectacle in itself. Thank you to the sponsors for making the event possible and supporting Philippine fighting game events. Thank you once more to Grab, Razer, Datablitz, Globe, NVIDIA, and Fatboys Pizza. Thank you to Twitch, Matcherino, and Team Spooky for their contributions to the prize pool, bringing it to a grand total of 100,000 PHP. 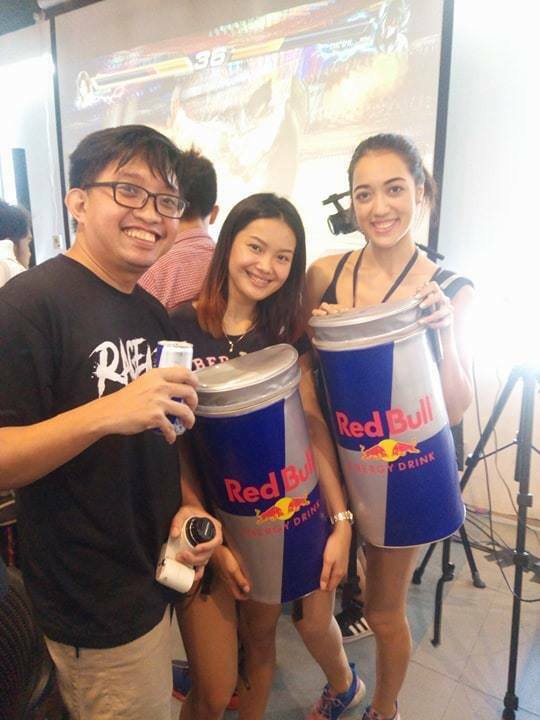 Thank you to the Red Bull Wings team for dropping by earlier in the day, providing the players a much needed boost of energy. 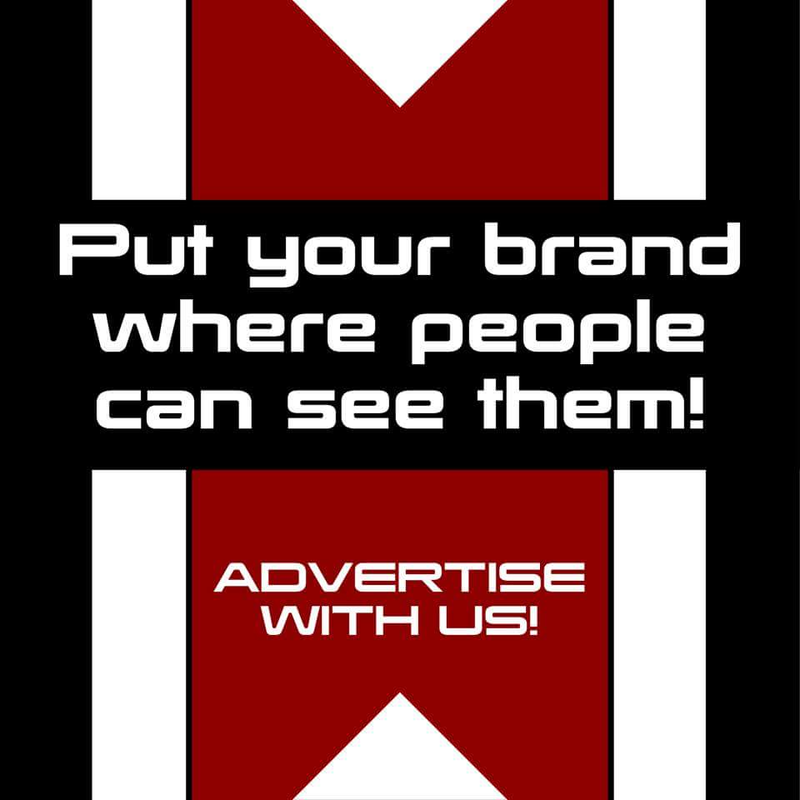 Let’s show our sponsors some love and give them a like and follow! 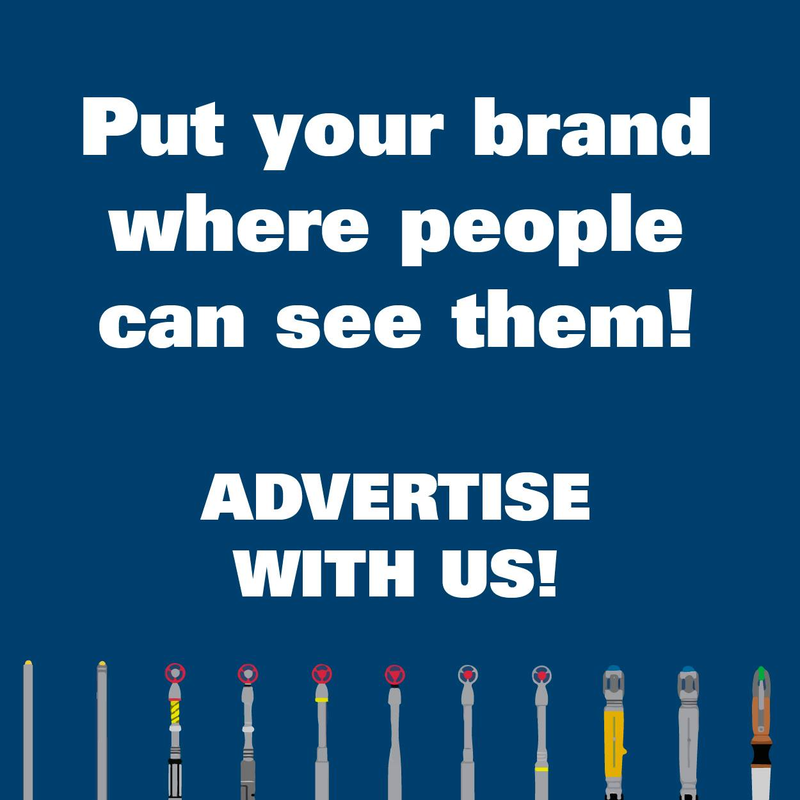 Visit their shops and tell them we sent you! Thank you to the organizers, staff, and volunteers for all your hard work and running the event. Thank you everyone for your support! Without all of you, this event would not have been possible. This is only the beginning. See you again for REV Major Philippines next month on Saturday, July 8 and Sunday July 9, 2017 at the Power Mac Spotlight Center in Circuit Makati!